FC Halifax Town lost their second game of the season as they were beaten 1-0 by Chester in a highly-entertaining contest at The Shay. Halifax played their part in a superb spectacle that merited more than a single goal, and would have got one but for some excellent goalkeeping from Town’s Matt Glennon and Chester’s Jon Worsnop. Starting the season with back-to-back defeats is hardly an ideal way to begin the new campaign, but both games have offered enough, especially Town’s first home outing, to suggest a patient approach to the club’s new-look squad will pay dividends. Chester certainly showed they’re capable of giving any side in the National League a game if they reproduce some of their passages of play from this match, with Jordan Chapell’s goal capping their brightest spell during the first-half. 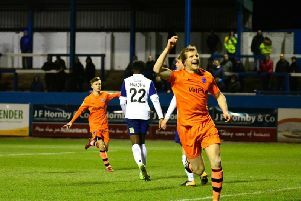 Both sides were on the ropes at different stages, but despite gaining the upper hand after the interval, Halifax couldn’t find a way through and will now hope to get their first points on the board against Torquay on Saturday. The presence of 495 away supporters meant the atmosphere was bubbling at kick-off, and even more so when Jordan Burrow headed narrowly wide from Josh Macdonald’s early free-kick. Macdonald’s dangerous cross was then superbly cleared by Ryan Higgins after Sean Tuton led a rapid counter-attack moments later. The pattern to a very watch-able first half-an-hour had been set. Town’s only change from the defeat at Boreham Wood saw Graham Hutchison replace former Chester skipper Matty Brown. But the centre-back’s first contribution was nearly an own-goal, but for a fine reaction save by Matt Glennon to turn his inadvertent touch round the post; from the resulting corner, Ben Heneghan headed just over. With both sides fielding three central midfielders, space was generally to be found out wide, with Tuton and Macdonald, as they had on Saturday, looking lively outlets for the hosts, while the over-lapping Higgins was a threat on Chester’s right flank. The tricky Craig Mahon found space to fire a shot just wide of the post before Macdonald and Kingsley James, given a gentle booing by the Chester fans when he touched the ball, both saw shots comfortably saved. If Saturday’s game had taken a while to get going, this was breathless stuff as the sides traded blows almost by the minute, with Ross Hannah next to be denied. Chester were sharp and incisive going forward, with Chapell seeing a shot blocked after a quick break, while Mahon and John Rooney produced some neat touches and clever movement. And it was after a strong spell of pressure that Chapell struck, as his low drive took a nick on its way past Glennon from just outside the box. Halifax weren’t short of effort but were sloppier in possession by comparison. Burrow provided a strong aerial presence but the hosts’ build-up play was a little laboured in contrast to the guile Chester had displayed before their opener. Hannah came within a whisker of doubling Chester’s lead moments after the interval when he headed a free-kick just wide. Hibbs then found space in the box but hesitated before crossing rather than going for goal. Glennon was then forced into two excellent saves to keep out Ton Shaw’s drive and Rooney’s free-kick which drifted through the area without a touch and almost crept in. Neil Aspin had seen enough by the hour-mark to bring on Connor Hughes and switch to a 4-4-2, with fellow substitute Danny Hattersley partnering Burrow in attack. Hattersley’s celebrations were then controversially cut short by the offside flag after Burrow tried to turn in James Bolton’s low cross, although it was unclear whether the touch goalward came from the town striker or a Chester defender. Bolton took it on himself to try for goal, bringing a fine save from Jon Worsnop with a long-range effort as Town began to build some momentum. The game had reverted to the engrossing action from the early part of the first-half, with Town sensing an equaliser and Chester sensing a potentially match-winning second. Town had a penalty appeal waved away for an alleged push on Hibbs before Burrow’s close-range header was saved on the line by Worsnop after Tuton had dug out a fine cross on the right wing. If Chester wanted the three points, they were having to earn them. Chester’s interest in adding a second was diminishing by the minute as they were pinned back by a swarming Halifax attack, with the impressive Tuton Town’s best route to goal down the right. But for all Halifax’s huffing and puffing, Chester were only denied clear daylight by some outstanding goalkeeping by Glennon, who denied Hannah, Chapell and Higgins in quick succession as the match came full circle in a fabulous finish. Cries of ‘you don’t know what you’re doing’ emanated from the odd Town fan as referee Wayne Barratt still found time to twice ignore the hosts’ claims for handball, once inside the box and once just outside. Halifax: Glennon, Bolton, Bencherif, Hutchison, McManus, Tuton, James, Whitehouse (Hughes 59), Hibbs, Macdonald (Hattersley 46), Burrow (Bishop 86). Subs not used: Porter, K Roberts. Chester: Worsnop, Higgins, Sharps, George, Hunt, Heneghan, Shaw, Rooney, Chapell (Thomson 89), Mahon (Kay 86), Hannah (Peers 90). Subs not used: Forth, Tonge.